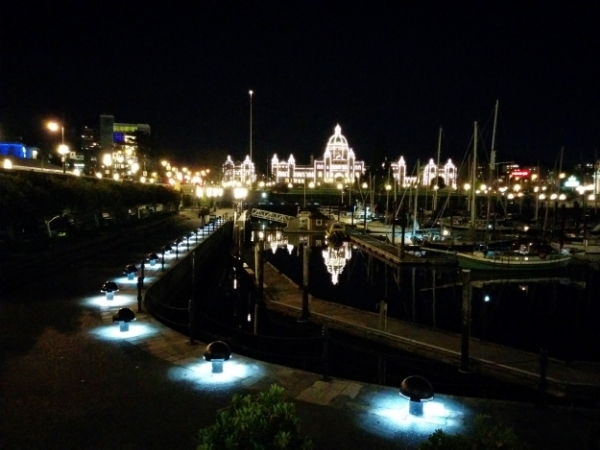 The Victoria Harbour is as busy as it is steeped in history. These days it's a bustling hub for personal craft, U.S.-bound ferries, and seaplanes. That's just on the water. Along the waterside is the epicenter of tourist activity because of the proximity of the Empress Hotel and the Parliament Buildings. The waterfront itself is lined with stalls and vendors selling everything from authentic First Nations art through caricatures sketches by tourist artists. The habour started life as the main landing for Fort Victoria which was built in 1843. The humble beginnings of this fur trading outpost gave way to a boom of activity during the Fraser Canyon Gold rush in 1858 and subsequently the Cariboo Gold rush in 1861. Both events swelled the traffic to Victoria bringing with it trade and wealth. The attraction of Victoria for the influx of fortune seekers turned out to be down to a red tape. As the local capital, Victoria was the only place where gold surveyors could buy the necessary licenses to prospect for gold on the mainland. While difficult to imagine now, at the time New Westminister (founded in 1859) and Vancouver (incorporated in 1886) were both secondary to Victoria as the administrative capital, a fact that is still true to this day in British Columbia.